It wasn't that long ago that Blue Jackets fans were frustrated with GM Jarmo Kekalainen for drafting a converted winger in a down QMJHL with the third overall pick in the 2016 NHL Draft, going against virtually all public draft rankings and conventional wisdom in spurning countryman Jesse Puljujärvi. Fast forward not even two years, and Pierre-Luc Dubois has exceeded, no, shattered, expectations. He's not just centering the first line in Columbus, he is legitimately a first line center. John Tortorella, who is constantly praising Dubois, ripped into his center depth chart in late January, saying repeatedly at a morning press availability: "I have one center playing - One". For the record, he wasn't referring to Alexander Wennberg, Lukas Sedlak, or Riley Nash. Through 51 games this season, Dubois is just one goal two points away from matching his 20-goal and 48-point season from his rookie campaign. His 27 assists rank second on the club, behind Artemi Panarin, and his 19 goals are just one shy of the Breadman. But what's even more impressive is how he compares to his peers. Hockey Reference, a great tool for those with an affinity for hockey stats and a bit of extra time, does well to illustrate his impact compared to other elite players around the NHL. Since 2007-08, how many 20-year-olds have had the same type of point production as PLD? This season, Dubois ranks 10th, with 0.90 points/game, behind some of the game's elite stars. And it goes beyond points for Dubois. He has also shown an ability to match up against other team's top lines; his 52.24% CF% is second on the team (minimum 100 minutes) behind, you guessed it, Panarin. He's been effective in driving play for Columbus while keeping possession from the other team. 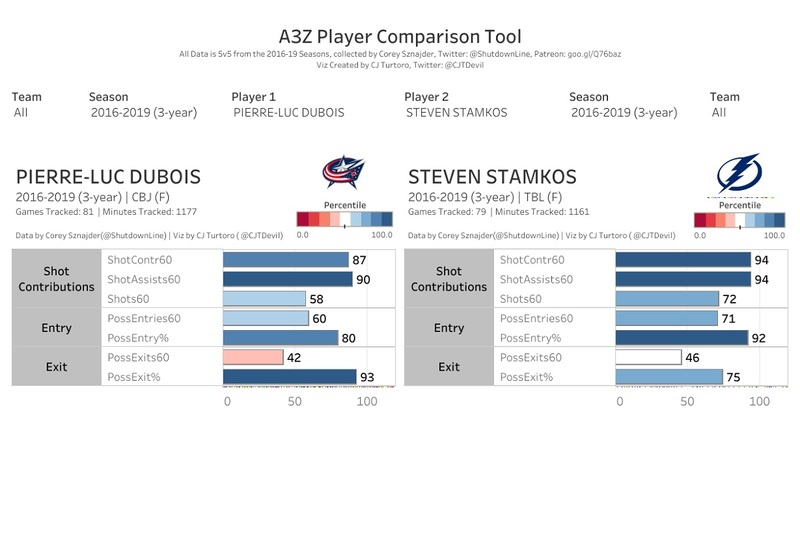 The below player tracking tool, provided by CJ Turtoro, shows that Dubois stacks up relatively similar to Steven Stamkos in terms of their puck possession contributions. Again, there are worse players to be compared with than the captain of the most dominant team in the NHL, a man who signed an 8-year, $68M contract in 2016, the same year Dubois was drafted. The sky is the limit for Dubois. There is seemingly no challenge too daunting for him in only his second NHL season, and for a franchise that's historically bereft of high-end talent at the center position, that's a great step in the right direction.